Tipoff: 7 p.m., Gampel Pavilion, Storrs, Conn.
What's at stake? : This is likely Buffalo star guard Cierra Dillard’s last game in a Bulls uniform. UConn has won 93 consecutive home games dating to 2013 and doesn’t figure to drop this one to Buffalo. UConn (32-2) has advanced to the Final Four in each of the last 11 seasons, winning six national championships in that span. UB (24-9) is looking for a second consecutive trip to the Sweet 16, despite returning just one starter from last season. The Huskies: Katie Lou Samuelson and Napheesa Collier have combined to score 4,558 points, the most of any classmates in UConn history. One of them has led UConn in scoring in 27 games and rebounding in 29 games this season. Samuelson returned in Friday's 101-61 win against Towson in the first round after suffering a back injury in the second to last game of the regular season. She had 11 points in 22 minutes. UConn owns a 118-19 record in NCAA Tournament play, the best record in the sport. This is the Huskies’ 31st consecutive appearance in the NCAA Tournament. They have advanced to 19 Final Fours and won 11 national championships in that span. The Huskies were ranked No. 2 in the country in the final Associated Press poll, were ranked in the top five all season, and won a sixth consecutive American Athletic Conference tournament championship. (They are 120-0 against AAC opponents since joining the conference.) Somehow, they were not awarded a No. 1 seed by the tournament selection committee. They are 18-2 all-time as a No. 2 seed. The Huskies lost more than one regular season game for the first time since the 2012-13 season, when they dropped four but went on to win the national championship. The Bulls: Dillard has rewritten the school’s record book in her two seasons since transferring from UMass, and will be a focal point for the Huskies’ defense. 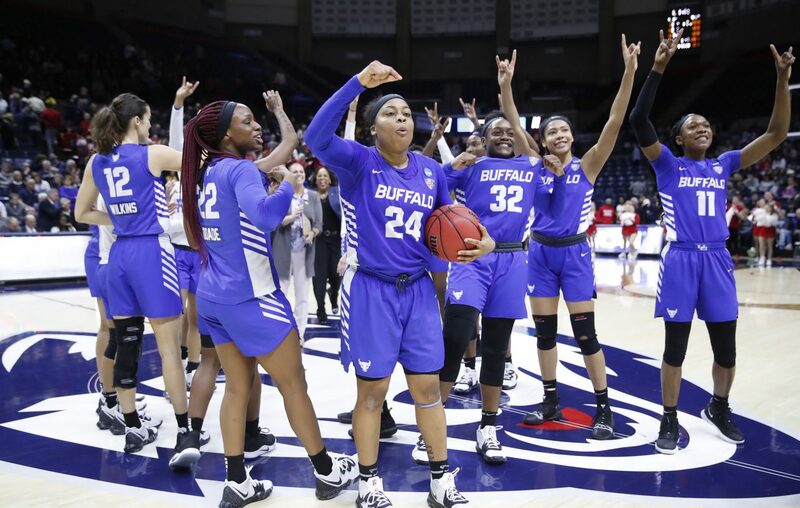 Dillard returned to school for her senior season to win a Mid-American Conference championship, rather than enter the WNBA draft, and the Bulls did just that. By defeating No. 7-seeded Rutgers, 82-71, in the first round on Friday, the No. 10-seeded Bulls became the first MAC team to win NCAA Tournament games in consecutive seasons. That victory and getting a taste of what it’s like to play UConn should provide valuable experience for one of the youngest teams in the nation. Junior forward Summer Hemphill, who averaged a double-double this season, will have her work cut out for her in the post. Sophomore point guard Hanna Hall headlines a group of nine underclassmen, including seven freshmen. Outlook: UB can’t match up with UConn’s size, strength, talent, depth and experience, but few teams can. It’ll be interesting to see what Dillard is able to accomplish against a level of competition she’s rarely seen. It won’t be a surprise if she puts up numbers. She’s that good. Dillard will be playing next season in the WNBA, but it'll be a tremendous upset if her collegiate playing career doesn't end here. And that is nothing to be ashamed of. On the contrary, far from it. What she and this young team have accomplished is remarkable. Let's see if UB can hold the Huskies to fewer than 100 points and cover the spread.